Clearwater, Florida is a busy town in Pinellas County that offers many great attractions for residents and visitors, such as beautiful beaches and the famous Clearwater Marine Aquarium. In turn, our company (Done Rite Party Rentals) offers the folks in Clearwater the opportunity to rent our outstanding bounce houses for birthday parties and all things festive. If you are planning a party in the city of Clearwater, our company has just the latest in bounce houses and water slides to keep your party guests (young and old) entertained for hours. Clearwater got its name from fresh water springs that once flowed along the high bluffs located in the city at the location where downtown Cearwater stands today but even though those water springs have long since vanished, the city has progressed into the modern town we know today. Part of that progression has welcomed the new age of celebrative parties, such as the use and rental of inflatable bounce rides, water slides and related party themes. Bounce houses and castles, etc. provide a fun and, if used properly, a safe place of exercise and amusement. We are a family oriented party rental business which likes nothing more than helping folks enjoy themselves. Our customers sometimes refer to us as the ”fun wizards” but we are officially called “Done Rite Party Rentals” and we have a variety of water rides and bounce houses for rent in the city of Clearwater. Done Rite Party Rentals prides itself on prompt party timing. We will set up and secure each rented inflatable ride well before your guests are expected to arrive and will take each item down and remove from the party locale at the designated time after the closure of the celebration. Safety measures are of prime importance to our company. Our inflatable house units are inspected, cleaned and sanitized before and after each rental use. Our company inflatables are available for rent for any size event….large or small. We can supply birthday parties, fairs, school functions, PTA fundraisers, church carnivals, picnics and more. There is nothing like a bouncy ride to make your special occasion shine! 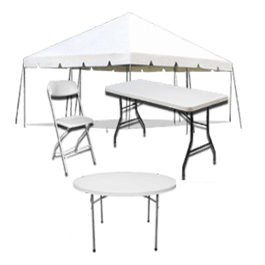 We offer extra party rentals such as tables and chairs and even tents. 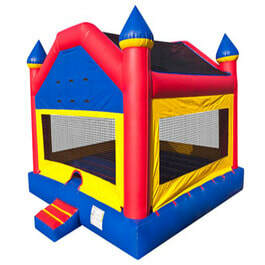 Our bounce houses and all inflatable party gear is available in various themes. Our water slides come in “small fry” sizes and sizes fit for adults. 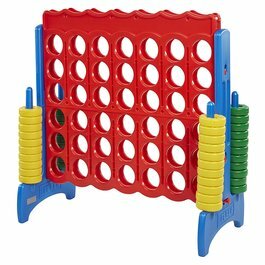 Ask about our assortment of party games when you reserve a bounce ride. 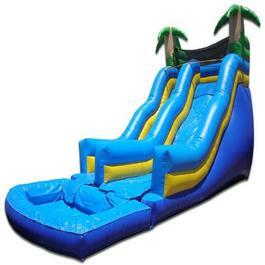 Water slides and bounce inflatables can be rented by the piece or we also offer a package deal. For the ultimate party experience, try renting one or two bouncers (moonwalk, castle, house or jumper) and combine that with some fun games. You can choose your own themes for slides and bouncers or, if you are unsure of what would suit your celebratory needs, our Done Rite Party Rentals staff will be pleased to assist with your selections. 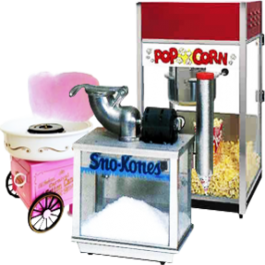 Why not opt for some tasty treats, such as popcorn, cotton candy or snow cones? YES...you guessed it! Our party rentals include vending machines. Should you prefer not to drag in your own beverages, we offer cold soda and water. Whatever your celebration is, we are the party rental enterprise that can fulfill all of your needs. Our company is licensed and insured and abides by all Clearwater rules and regulations for operating a public business. Help us help you in creating the ideal party experience for you, your family and friends. Children and adults, alike, will walk away with big smiles on their faces and the words “Done Rite Party Rentals” on their tongues.